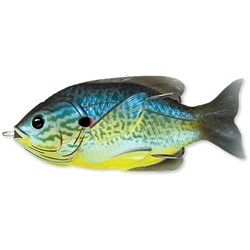 Replicates a juvenile Sunfish, pushed to the surface by predatory fish. Ideal for Largemouth Bass and Northern Pike. Custom double hook. Weedless design makes it ideal for the thick slop. Easy to walk slow with a 180° swing, or walk it fast to create a bubble trail. High hook up ratios. Freshwater.